Pricing will show automatically when you design your gate so you don't need to read all these tables! Each style has its own pricing table. Scroll down to find the style of your choice, or click here for Mission Pricing, Classic Pricing, Cat Escape Pricing, Beadboard Pricing, Snaptight Pricing, Folding Gate Pricing, Tall Gate Pricing, and Deck Gate Pricing. Each square in the table shows two prices for a specific height and width. 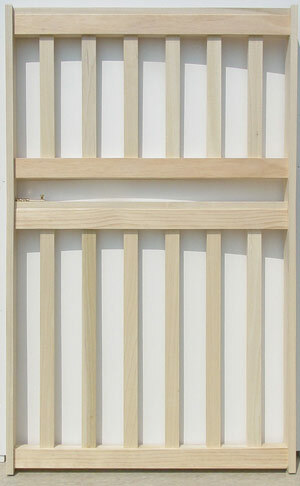 The first is for an assembled gate (no stain or finish). 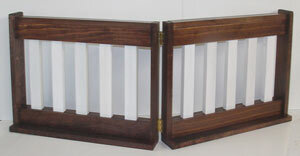 The second lower price, if shown, is for the kit (loose wood parts, wherein you build the gate). 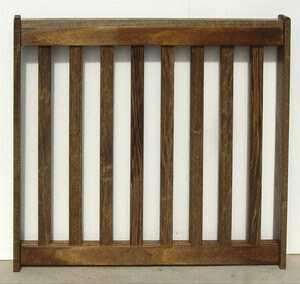 Add $49 for an overall stained or pickled finish (for gates or kits). Everything will be stained (or pickled) and sealed in a polyurethane finish: the gate, all its wood parts including the wall planks. 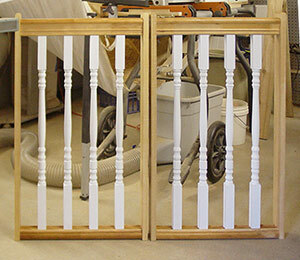 Add $59 for a two-tone finish (such as stained gate with White spindles), or a gate that is completely painted. If you request a paint color other than white, please add $15 for your custom paint, on top of the $59 paint fee. An example: For a single panel gate that is 31 inches wide and 32 inches tall, it would cost $174 as a gate, or $113 as a kit with unfinished wood. A stained gate would cost $174 plus $49, or $223. A kit with stained wood in that size would cost $162. All of this would be explained in your custom design and quote! To view more pictures and details about Mission gates, click here. Width Under 28" 28" to under 34" 34" to under 36" 36" to 40"
An example: For a double panel gate that has two panels spanning 48 inches wide and 32 inches tall, it would cost $254 as a gate, or $165 as a kit with unfinished wood. A stained gate would cost $254 plus $49, or $303. A kit with stained wood in that size would cost $214. All of this would be explained in your custom design and quote! To view more pictures and details about Mission gates, click here. 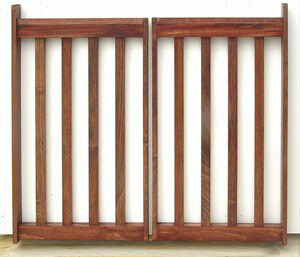 Width Under 36" 36" to under 46" 46" to under 58" 58" to 65"
An example: For a single panel gate that is 31 inches wide and 32 inches tall, it would cost $214 as a gate, or $139 as a kit with unfinished wood. A stained gate would cost $214 plus $49, or $263. A kit with stained wood in that size would cost $188. All of this would be explained in your custom design and quote! To view more pictures and details about Classic gates, click here. An example: For a double panel gate that has two panels spanning 48 inches wide and 32 inches tall, it would cost $294 as a gate, or $191 as a kit with unfinished wood. A stained gate would cost $294 plus $49, or $343. A kit with stained wood in that size would cost $240. All of this would be explained in your custom design and quote! To view more pictures and details about Classic gates, click here. An example: For a single panel gate that is 31 inches wide and 32 inches tall, it would cost $189 as a gate, or $122 as a kit with unfinished wood. A stained gate would cost $189 plus $49, or $238. A kit with stained wood in that size would cost $171. All of this would be explained in your custom design and quote! To view more pictures and details about Cat Escape gates, click here. 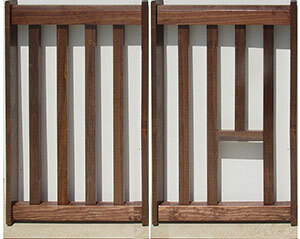 Double Panel Gates: The double panel cat escape gate is priced $15 more than the mission style double panel gates, above. Essentially, we will put a cat opening into ONE of the two panels, centering it as best we can. 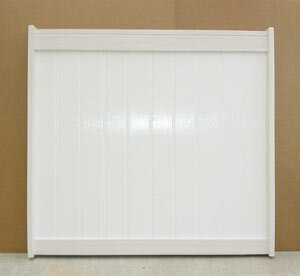 An example: For a single panel gate that is 31 inches wide and 32 inches tall, it would cost $224 as a gate with unfinished wood (beadboard can be cedar or primed whiteboard). They are not available as kits. A stained gate would cost $224 plus $49, or $273. All of this would be explained in your custom design and quote! 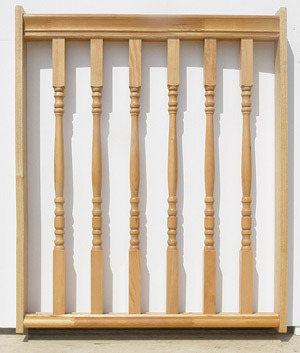 To view more pictures and details about Beadboard gates, click here. An example: For a double panel gate that has two panels spanning 48 inches wide and 32 inches tall, it would cost $304 as a gate with unfinished wood. It is not available as a kit. A stained gate would cost $304 plus $49, or $353. .
An example: For a double panel folding gate that is 47 inches wide and 20 inches tall, it would cost $ 201 as a gate, or $140 as a kit with unfinished wood. A stained gate would cost $201 plus $49, or $250. A kit with stained wood in that size would cost $189. All of this would be explained in your custom design and quote! 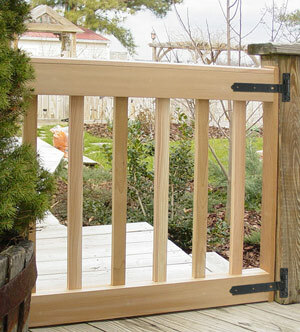 To view more pictures and details about Folding gates, click here. 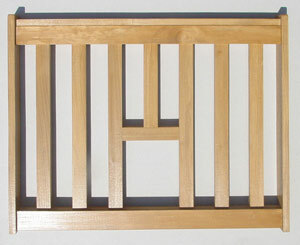 An example: Available only as single panels, and not as kits. 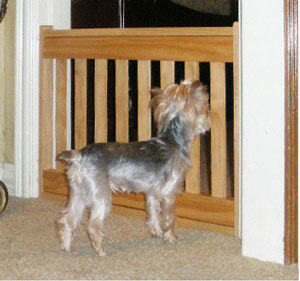 For a single panel gate that is 31 inches wide and 47 inches tall, it would cost $273 as a gate with unfinished wood. A stained gate would cost $273 plus $49. All of this would be explained in your custom design and quote! 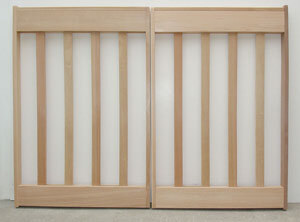 To view more pictures and details about Tall gates, click here. Width Under 28" 28" to under 34"
An example: For a single panel gate, in your doorframe, that is 31 inches wide and 32 inches tall, it would cost $174 as a gate, or $113 as a kit with unfinished wood. A stained gate would cost $174 plus $49, or $223. A kit with stained wood in that size would cost $162. All of this would be explained in your custom design and quote! To view more pictures and details about Snaptight doorway gates, click here. Not available as two panel gates. An example: For a single panel gate that is 31 inches wide and 32 inches tall, it would cost $209 as a gate, or $135 as a kit with unfinished wood. Not sold stained or painted. All of this would be explained in your custom design and quote! An example: For a double panel gate that has two panels spanning 48 inches wide and 32 inches tall, it would cost $289 as a gate, or $187 as a kit with unfinished wood. All of this would be explained in your custom design and quote! 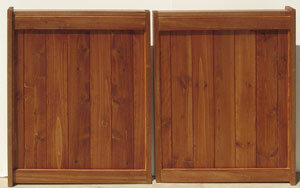 To view more pictures and details about cedar deck gates, click here.